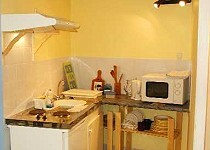 Large studio apartment for a couple, two friends or couple plus child. Converted from workrooms of vigneron. 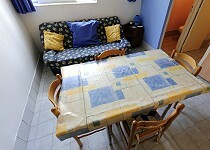 Popular summer apartment for an independent holiday apartment from which to explore the area or just spend some relaxing time in the sunshine of the south of France. The apartment is spacious, airy and cool. 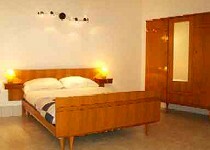 It contains a double and a single bed. There is plenty of space to add a cot or small child's bed if required. There is a shower room and separate wc. The apartment has a kitchenette (fridge, sink, 2 ring electric hob and microwave with grill) plus a dining table and chairs and a three seater settee. As with all our apartments it is well equipped with plenty of crockery, cutlery, pots and pans plus a kettle and coffeemaker. This apartment is spacious and, because it has been converted from the original workrooms of the vigneron (winemaker), it retains a constant temperature regardless of the outside temperature. Although modern in appearance, this apartment still has the original wood beams (half trees really!) from the construction of the original workrooms of the vigneron. It is possibly the most comfortable of our apartments during July and August.